Produced by a superior aluminum alloy, with high quality internal pinion shaft and piston after heat treatment, this door closer can resist the extreme internal hydraulic pressures with the top quality sealing parts in opening and closing. This remarkable design ensures that the long life using and stable for operation, Multi-function design in order to satisfy different customer requriements on door closing,keep the door smooth opening and closing in a stable way with this automatic door closer which saves you the time to get the door closed. All the products are go through tough testing and checking to ensure its safety, The pressure and speed which the door closes can also be masterfully controlled with adjustable valve screw and easy to adjust the pressures. Miricco Hardware is mainly produce all kinds of house-ware, including sanitary hardware,construction hardware,furniture hardware etc. for 20 years, with advancing design and excellent quality control, our product sell to over 60 countries all over the world, we dedicate to provide the best product for millions of customer with integrity. Applicable for wooden doors and glass doors with metal frame or wooden frame,is suitable for commercial, industrial and even extremely environments,Maximum 500,000 cycles tested without damage and 2 years warranty. High quality aluminum body with silver painting, German hydraulic oil and sealed rings,keep perfect working in -40° degree low temperature, inner components were all go through heat treatment to improve it's life time and hardness. Two independent regulating valves control sweep and latch speeds,Works for right or left handed closing doors,Includes mounting bolts and brackets shown in picture. The durable connecting rod and rotating shaft design allow the door closer to be mounted on left and right hand hung doors to guarantee a hassle free install. This door closer offers multispeed options for the pace, There are two options presented by this particular door closer and they offer ranges of 0° - 15° and 15° - 180° which will satisfy all conditions. If you have any questions about this product by Miricco, contact us by completing and submitting the form below. If you are looking for a specif part number, please include it with your message. 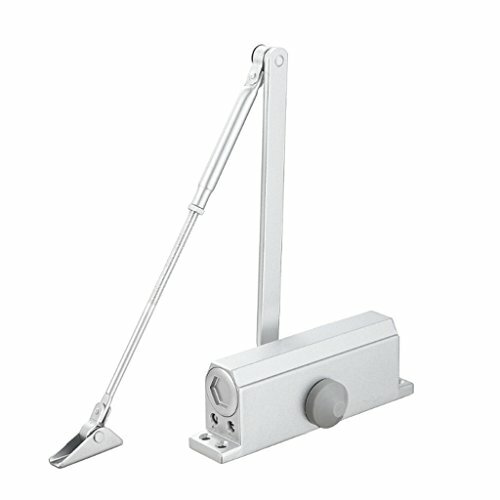 Commercial grade Door Closer, Heavy Duty aluminum automatic door closer, Hydraulic Arm, Non-handed -slowly closes- Variable latch speeds. Size 4 spring for doors up to 150 lbs by Life Essentials!